Rosenfeld Injury Lawyers LLC represents people with pressure sore injuries suffered in harm while receiving professional caregiving in hospital, nursing homes, rehabilitation centers, assisted living facilities and at home. Our law firm has collected a series of bedsore injury accident FAQs related to the medical and legal aspects of an injury involving receiving substandard care. Should you have additional questions, we invite you to contact our office for a free review of your legal rights. Pressure sores (bedsores, decubitus ulcers, pressure ulcers, pressure wounds) remain a leading cause of severe injury and death of the elderly, infirm, and disabled. Sadly, nearly every pressure sore could have been avoided if the nursing staff, doctor, facility or hospital develops and implements an effective Care Plan for bedsore prevention. 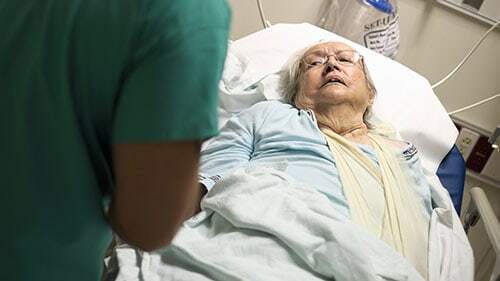 According to Health Care Research & Quality (AHRQ), nearly 2.5 million patients and approximately 60,000 individuals die every year from facility-acquired pressure ulcers injuries in nursing homes and hospitals. Statistics reveal that more than 17,000 plaintiffs and surviving family members filed medical malpractice lawsuits each year against hospitals, nursing facilities, and doctors at fault for causing bedsores. The bedsore injury attorneys at Rosenfeld Injury Lawyers (888-424-5757) represent clients seeking financial compensation for injuries sustained by substandard care had assisted living homes, nursing facilities, medical centers, and hospitals. Our legal team has compiled a list of the most common pressure sore injury frequently asked questions and posted the answers below. Pressure ulcers develop on the skin as a written door warm patch caused by a lack of sufficient blood supply that is cut off or reduced with pressure. Unrelieved pressure on the skin when the weight of the body compresses skin and underlying tissue. Shearing when skin layers are forced to slide against another surface like when sliding into a chair, across the bed or during transfers between a wheelchair and bed. Friction when the skin is rubbed against another surface causing heat damage. What are the Initial Indicators of a Developing Pressure Ulcer? Any discolored, warm or reddened skin at a pressure point site is often the first indicator of a developing bedsore that if left untreated can become progressively worse. What Areas of the Body or More Susceptible to Developing Pressure Wounds? Pressure wounds typically develop on the bony prominences of the body where bone can be felt under the skin. These areas tend to include the toes, heels, ankles, knees, hipbones, sacrum (tailbone), spine, shoulder blades, shoulders, elbows, hands, fingers, and the back of the head. Who is More Susceptible to Developing Pressure Ulcers? Anyone with limited mobility can develop bedsores. However, some individuals are at greater risk of developing a life-threatening skin condition compared to others. Quadriplegic and paraplegic individuals, the elderly, the disabled, the illness-stricken and patients in a coma are at greater risk of developing a pressure wound while in a hospital, nursing home, assisted living center, rehabilitation facility or at their residence. Are elderly, ill-stricken, or suffer injuries like broken hips or legs. Why do Pressure Ulcers Develop Quickly? Throughout the day and during sleep, humans regularly move without thought to alleviate pressure on the bottoms of the feet, back of the legs, across the shoulders and back and other areas of the body. This repositioning alleviates restricted blood flow on bony areas of the body. Without repositioning, any area that's compressed can cause substantial damage to the skin and underlying tissue in less than 90 minutes. Because of that, it is important to ensure that those with mobility challenges receive assistance in repositioning their body at least every hour to provide relief of pressure on bony areas. How Long Does it Take to Heal a Pressure Wound? Bedsores in their initial stages can heal within a day or two if the pressure against the damaged skin is alleviated until the wound healing is complete. If the pressure wound progresses to Stage II – Stage IV, the healing process can take much longer. Typically Stage III decubitus ulcers require surgical intervention (debridement) were a doctor surgically removes dead (necrotic) tissue on the outside or bottom of the opened wound. These pressure ulcers can take weeks or months to heal completely if the medical team provides appropriate care. Stage IV decubitus ulcers may never heal if the bone, tissue, ligaments, or muscles are exposed. At some point, a decubitus ulcer can progress to an unstageable wound which is often considered life-threatening. How can a Bedsore be Prevented? Caregivers are trained to follow developed Care Plans that include “turning” schedules to ensure that hospital patients, nursing home residents, and people receiving care in their house are repositioned when required. Additionally, the medical team, nursing staff, and caregivers are trained to identify an early developing (Stage I) bedsore to ensure it does not progress to a life-threatening condition. The Care Plan followed by the nursing staff will involve proven programs that prevent the development of decubitus ulcers for patients determined to be at-risk for bedsore development. How are Pressure Ulcers Staged? Stage I where a reddened areas skin appears on the skin and lasts for at least 30 minutes after pressure is alleviated. Stage II involves superficial damage to the skin typically displayed as an abrasion or blister. Stage III where full-thickness skin loss develops but does not reveal muscle or bone. Many patients experienced extreme pain at the wound site. Stage IV involves full-thickness skin loss that has progressed to include extensive damage to the skin and underlying tissue where bone, muscle, ligaments, and tissue are exposed to the surface. Unstageable when the pressure ulcer has degraded to a life-threatening condition. What are the Signs That my Loved One is the Victim of Nursing Home Abuse or Neglect? Identifying the signs and symptoms of abuse and neglect can be challenging, especially if your loved one has communication difficulties. However, there are usually obvious physical signs of neglect including the development of a progressing pressure sore. To validate mistreatment, interact with the nursing staff and review your loved one's Care Plan if you have the legal right. Look for signs of neglect, malnutrition, unexplained bruising, contractures, weight loss and dehydration. What do I do if I Have Identified a Bedsore Problem? If you recognize that your loved one has developed a bedsore that was caused by the neglect or mistreatment of the nursing staff, it is important to bring it to the attention of others in charge of providing care. Taking quick action can ensure that those in charge will take aggressive measures to prevent, reverse, or stop the degradation of the bedsore formation. The staff's quick action might include enforcing proper turning repositioning, using pressure relieving devices, and providing optimal skin care that keeps the skin dry and clean. Ensure that the nursing staff is providing your loved one dry, clean bed linens and that they receive adequate hydration and nutrition. Review your loved one's medical records to ensure that the medical team and nursing staff have used appropriate skin assessments including the Braden Scale (Braden Skin Assessment) that identifies patients at risk of developing skin issues. What can I do if the negligence caused my loved one's pressure wound? Before taking any other action, it is crucial to ensure that your loved one receives the best care immediately. If that task is too challenging, consider speaking with an attorney who specializes in medical malpractice and bedsore injury cases. Your lawyer working on your family's behalf can take legal measures to maximize your loved one's medical care including having them transferred to a different facility immediately. Every health care provider, nursing facility, and medical center that provide substandard care should be held legally and financially accountable. Their action and failure to prevent or provide appropriate treatment for a bedsore can be considered medical malpractice, a legal term used in civil tort law for seeking compensation and justice. Your only legal option is to utilize the civil justice system to hold those at fault for harming your loved one financially accountable. If you file a lawsuit on behalf of your loved one you can ensure that the mistreatment stops immediately and that your family will receive financial compensation to recover damages. How Much Monetary Compensation Should my Family Expect to Receive? Every case is different and unique. Typically, an attorney handling your case will gather evidence, speak to witnesses, review medical documents and investigate your claim for compensation to help identify every defendant involved in your case. Your lawsuit or compensation claim might include more than one defendant that could involve the caregiver, medical team, nursing management and supervisors, doctors, hospital, nursing facility, assisted living home, rehabilitation center, and even medical equipment manufacturers. While it is impossible to predict exactly how much your family will receive, your attorney will build a case to ensure you receive adequate funds to recover medical expenses, hospitalization costs, funds for future treatment and therapies, and non-tangible damages including pain, suffering, mental anguish, and emotional stress. If What my Loved One Died From a Bedsore do I Still Have a Case? Probably. The civil justice system allows surviving family members to file a wrongful death lawsuit if an attorney can prove that negligence, mistreatment or abuse by others directly resulted in their loved one's death. The amount of compensation the family receives is not just limited to medical costs, hospitalization bills, and out-of-pocket expenses, but also the family's pain, suffering, and grief along with funeral and burial costs. If your loved one was injured or died due to a developing, progressing pressure ulcer, you have the legal right to seek financial compensation. The bedsore injury attorneys at Rosenfeld Injury Lawyers have obtained millions in monetary recovery for our clients damaged by abuse, neglect, and mistreatment in nursing homes, assisted living facilities, hospitals, and while receiving caregiving at home. Our legal team encourages you to contact our law office at (888) 424-5757 to schedule a no-obligation initial case consultation at no cost to you. Let us review your case and provide numerous legal options on how to proceed to ensure your family receives the monetary recovery you deserve. We accept every wrongful death lawsuit through contingency fee agreements, meaning you pay only after we have successfully resolved your case in court or through a negotiated settlement.